The prickly pear is Opuntia: a genus in the cactus family, Cactaceae. The genus is named after the Ancient Greek city of Opus. There, according to Theophrastus, an edible plant grew which could be propagated by rooting its leaves. Prickly pears (mostly Opuntia stricta) were originally imported into Australia in the 18th century for gardens. They were later used as a natural agricultural fencing. They quickly became a widespread invasive weed. They changed 101,000 sq mi (260,000 km2) of farming land into an impenetrable green jungle of prickly pear, in places 20 ft (6.1 m) high. In 1919, the Australian federal government established the Commonwealth Prickly Pear Board to coordinate efforts with state governments to eradicate the weed. Early attempts at mechanical removal and poisonous chemicals failed, so in a last resort, biological control was attempted. There is a moth, Cactoblastis cactorum, from South America, whose larvae eat prickly pear. 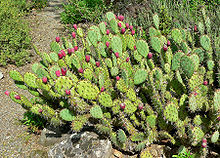 It was introduced in 1925 and rapidly reduced the cactus population. A memorial hall in Chinchilla (Queensland) commemorates the moth. This is one of the earliest known examples of the biological control of pests. ↑ Quattrocchi, Umberto (2000). CRC World Dictionary of Plant Names. III M-Q. CRC Press. p. 1885. ISBN 978-0-8493-2677-6. This page was last changed on 21 July 2016, at 06:15.